The poll also found M&S was top of the fashion chart and consumers still prefer store to online. The magazine Retail Week and Microsoft carried out a survey of 1,000 consumers and produced the report Fashion Retailing in an Omni-channel world. The fashion arena has been one of the most disrupted retail sectors in recent years, shaken up in large part by smart pure-plays, innovative start-ups and developments in fulfilment. As a result, apparel retailers are constantly evolving to develop offerings that not only meet but exceed customers’ expectations. • Price is still king – 77% of respondents cite it as one of the top three things they value about their favourite retailers. • Finding products out of stock is the number one issue that has caused our polled consumers to have a negative shopping experience at 54%. • A smooth returns process is vital to shoppers – 57% say it is very important and 34% say it is quite important to their buying decision. • M&S tops the fashion charts, as 33% say it is their favourite fashion retailer, followed closely by Next at 31%. • The physical store still beats online as the preferred way for consumers to shop for fashion, with 62% saying they prefer to shop for fashion in store. Amazon tops the online fashion table, as 57% of consumers say they would normally shop with the online giant. • 82% of consumers say good quality items are what makes a great fashion brand. • The draw of in-store technology for consumers is better visibility of a range of special offers delivered directly to smartphones or tablet devices. 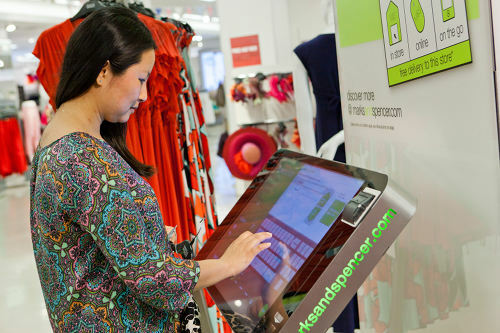 There is a lot of opportunity for retailers to wow consumers with in-store technology.